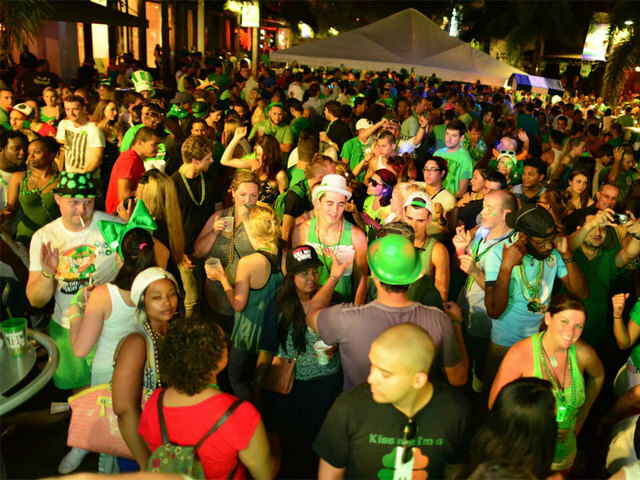 Are you ready for St. Patrick’s’ Day 2016 in Palm Beach County? Here is the scoop on festivities for this year’s Clematis Street block party! St Paddy’s Day falls Thursday, March 17th. Get ready to start your St. Paddy’s Day celebration early this year as the 17th falls on a Thursday. The major celebration will begin once the normal workday winds down (4-5pm) but there are several specials & happenings starting as early as 9am! You can expect Clematis Street to close down Thursday starting at 4pm for the major festivities. Expect lots of drinking, lots of green and a somewhat rowdy drinking-crowd. This is generally not a family-friendly event. Expect the block party to end relatively early, with Roxy’s entertainment stopping at 9pm. While the party is likely to continue for many, the main timeframe for the party on Clematis will be from 4-9pm. There is no fee for entry to the block parties. Bagpipers, Irish Dancers and the Amadans from Ireland are part of O’Shea’s St. Patrick’s Day celebrations. O’Shea’s will be shutting down the 500 block of Clematis for the party.Call 561-833-3865 for additional information. Roxy’s will be closing off their section of the street at 4pm with DJ’s and live music to begin at 5pm. Roxy’s is also having “Keg & Eggs” all day starting at 9am. If you’re off work on Thursday, you can start the celebration early!